Choosing the right Chiropractor is an important choice to make. Dr. Green and his staff are trained on the latest chiropractic treatments & technologies. Today, you dont have to live with that pain anymore. Thanks to the concerted efforts of a team of top physicians and medical engineers, Spinal Decompression was developed to effectively treat lower back pain and sciatica resulting from herniated or deteriorated discs. Spinal Decompression not only significantly reduces back pain in many patients, but also enables the majority of patients to return to more active lifestyles. 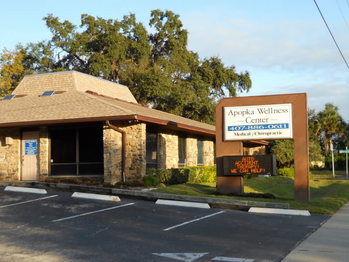 Thank you for visiting the website of Apopka Chiropractor Dr. Adlai Green and Apopka Wellness Center - a professional Apopka chiropractic clinic. In practice as well as online, Apopka Florida 32712 chiropractor Dr. Green strives for excellence through superior patient treatment, education and satisfaction. Within our website, Apopka and surrounding area residents will find all types of health and wellness related information including information about our office and services, chiropractic, back and neck pain, work and auto injuries and much, much more. We hope you enjoy the information within and share it with others. Again, thank you for visiting www.apopkawellnesscenter.com and remember to come back often.